This report describes our development of the proposed CLASS benefit plans in the Office of CLASS. It is written for the general audience with a basic knowledge of the CLASS Act1. Marketable to a large number of employers and employees. Provisions of the CLASS Act form the basis for development of the proposed benefit plans. We believe we have adhered to relevant professional actuarial guidelines and recommendations2. This report represents the contributions of its authors to plan development process as of its release date. Final proposed benefit plans may be different from the ones discussed here. We have sought guidance from experts in the CLASS Office. Interpretations and views expressed in this report are the professional opinions of its authors3 and may not be consistent with the opinions of the Office of CLASS, the Office of the General Counsel or the Department of Health and Human Services (HHS). Throughout this report, the word “we” refers to the authors of this report and on one else. There is an unmet need to protect working Americans against the high costs4 of long-term care services5. Few of them have financial protection against the significant risk of eventually using the services6. This is especially true for workers with modest income who are vulnerable to become future Medicaid beneficiaries. Insurers have been exiting or curtailing their long-term care insurance business. Recent development in the interest rate environment, accounting standards and regulation on the use of genetic information suggest a dim future. Well publicized significant premium increases have shaken consumers’ confidence in the product. Currently only three major insurers7 are actively offering group long-term care insurance. Opportunity is therefore limited for working Americans in seeking cost-effective protection against the risk of high long-term care costs. CLASS is designed to be a voluntary, affordable long-term care insurance program for the American workers. It will provide a modest level of benefits to help qualified beneficiaries to live independently in the community. Beneficiaries will have considerable freedom to dictate the appropriate services and supports for themselves. Benefits are paid entirely through enrollees’ premiums without any taxpayer subsidy. Compared to private insurance, the CLASS Program has been transparency and accountability because of its certification process. Long-term care is as much a problem for the young as it is a problem for the old. With most working Americans unprotected, Medicaid will continue to be the payer of last resort for their future long-term care services. This is an escalating burden particularly for our future generation of taxpayers who are becoming fewer in number compared to the older generation8. Enrollment in the CLASS Program could delay and reduce future dependence on Medicaid. Thus the CLASS Program promotes individual responsibility and less reliance on government for support. The Class Program has the potential to have a seminal effect on long-term care financing in this country. It could significantly increase public awareness of the risk of long-term care. Future Medicaid spending could materially be reduced if more Americans seek insurance protection, whether through CLASS or the private market. Tight controls on Medicaid long-term care spending become more acceptable when programs such as CLASS are available as an alternative. The CLASS Program could be the catalyst for a much needed national aging policy to improve the quality of life for older Americans. Due to the lack of conference reports and other explanatory documents, we effectively relied only on the text of the statute for benefit plan design. The CLASS program is a voluntary insurance program9. An insurance program allows a group of individuals to share the risks by collecting premiums from everyone and paying benefits only to those for whom the risk materializes. An insurance program operates under the law of large numbers. That is, the individuals in the program form a sufficiently large homogeneous group with relatively the same risk so that the actual claim results will be close to that assumed in the premiums. In a voluntary insurance program, the group must be relatively free of asymmetric information where certain insureds have better information about their risk of claiming benefits than the insurer. Otherwise, premiums will be high and unattractive to lower risk individuals. This situation would render the program unworkable. A CLASS benefit plan is actuarially sound if, at any time, the balance on the trust fund, all future anticipated premiums and investment income, in aggregate, are adequate to provide for all reasonable and appropriate anticipated future costs, including plan benefits, benefit-related expenses, marketing and administrative expenses. Actuarial soundness is a prospective determination of projected income covering projected outgo with a certain comfort level. This definition implicitly satisfies the stipulation that no public funds can be used to pay CLASS benefits12. An actuarially sound benefit plan encompasses not only the benefit design that makes if sound but also other rules of the plan that serve to minimize moral hazard13. These rules affect the procedures for enrollment and reenrollment, conditions for enrollment and benefits, etc. The statute also requires the CLASS Program be sustainable over a 75-year period such that their will be sufficient funds to pay future benefits. A plan that is deemed actuarially sound would provide good assurance (though not absolute guarantees since future events are uncertain) that the Program is sustainable. On the other hand, a program where the projected income barely covers the projected expenses may be sustainable but it is not actuarially sound because there is insufficient margin for future unfavorable experience. The CLASS Independence Advisory Council will recommend a benefit plan for designation as the CLASS Independence Benefit Plan that “best balances price and benefits while optimizing the probability of long-term sustainability of the Program”14 (emphasis added). These two phrases epitomized the value proposition of CLASS to the American workers. In order for the Plan to be attractive to the consumers, it needs to be competitive with private insurance. Ensuring long-term sustainability will result in stable premiums for the enrollees. While the statute prescribes certain conditions and restrictions, in no way does it define a specific plan. In fact, the statute requires at least 3 actuarially sound plan choices for consideration15. The statute thus anticipates alternative plan designs to be developed within its confine. Being actuarially sound does not satisfy all of the design goals. The designated plan still needs to be attractive to the consumers. No underwriting can be used to determine premiums or to prevent enrollment16. Taken together with the voluntary nature of the Program, this restriction poses potential adverse selection risk. The Secretary is authorized to set premiums, designate the benefit plan and promulgate regulations regarding enrollment, benefit eligibility, claim payment, etc. Implementing the statute involves interpretations that may be subject to challenges. Certain provisions in the statute appear to be in conflict with each other, specifically, with the premise of voluntary insurance. We discuss this further in the section below on Adverse Selection. The statute explicitly contemplates an actuarially sound plan that “maximizes the probability of long-term sustainability”. Thus it would appear that, if a designated plan exists at all, it will unlikely be an entitlement program. Similar to social insurance such as Social Security and Medicare, the CLASS Program is administered by the federal government, the benefits and eligibility criteria are established by statute, the accounting of income and expenses is through a trust fund (CLASS Independence Fund) and premiums are paid by the participants. Nevertheless, major distinctions exist between social insurance and the CLASS Program. Participation in social insurance is either compulsory or it is heavily subsidized so that the majority of eligible individuals choose to participate. Social insurance is generally not fully funded in that monies are not set aside to ensure that all future promises will be met. CLASS is voluntary and the majority of the eligible workers are not expected to enroll. It is fully funded by premiums collected from the enrollees, except for the initial program start-up costs. In certain aspects, CLASS is closer to private insurance than social insurance. Both private insurance and CLASS are fully funded by premiums. Both call for margins in the premiums to protect from a certain level of unfavorable experience17. The CLASS trust fund acts like a reserve fund for private insurance; both funds are backed by the credit-worthiness of the insuring entities. In order to be competitive with private insurance, one perceived gap between CLASS and private long-term care insurance may need to be narrowed. That is, benefits in private insurance are contractual; they can be altered only if the insurer is insolvent. This is not the case in the CLASS Program. However, we believe a hierarchy could possibly be established to adjust premiums and other factors first before adjusting benefits. A precept of the statute is that no underwriting, other than age, can be used to set premiums or prevent enrollment into the Program. Because the CLASS Program is voluntary, there is a strong potential for the Program to attract a disproportionate number of high risk workers who are likely to need long-term care services. This adverse selection violates the principle for a sound insurance program. Private long-term care insurance generally requires underwriting and therefore can expect to have lower claim costs than that for the CLASS Program. Other things being equal, CLASS premiums may have to be considerably higher than the premiums for private insurance. If CLASS premiums are uncompetitive against private insurance’s premiums, healthy workers who can meet underwriting requirements would likely pick private insurance over the CLASS Program. As well, employers have a fiduciary responsibility to look out for the best interest of their employees. They would also decline to offer CLASS if the premiums are too high. This exacerbates the problem of a higher than expected concentration of unhealthy enrollees. There may also be organized efforts to encourage workers with functional limitations to enroll. All these factors make it very difficult to determine the correct premiums. Estimating premiums with this high level of variability is akin to gambling with the enrollees’ funds; gambling is clearly not the role of the insuring entity. Initial premiums with likely be inadequate if the enrollment of healthy workers turns out to be lower than was assumed in the pricing. Subsequent premiums would need to increase. This action would tend to drive out the healthy enrollees who can get lower premiums through private insurance. With fewer healthy enrollees, there may be more premium increases. This rate spiral can lead to program insolvency. Because of the potential for adverse selection, a number of experts have opined that the CLASS Program is unworkable. In order to compete with private group long-term care insurance for enrollment, CLASS premiums need to be on par with the premiums for private insurance. Group long-term care insurance generally has a 65% loss ratio. That is, the present value of future benefits is projected to be 65% of the present value of future premiums18. The balance of 35% is essentially earmarked for profits and expenses. A realistic and reasonable projected loss ratio for the CLASS Benefit Plan is 80%19. If the CLASS premiums for the CLASS plan exactly matched private group long term care insurance’s premiums for identical features and benefits, the CLASS Program will have an approximately 23% (80% ÷ 65% - 1) claim allowance over private insurance that can be used to account for the adverse selection effect. The challenge is to control the impact of adverse selection within this allowance20. Without any mitigation for adverse selection, premiums for an actuarially sound CLASS plan will need to anticipate that virtually every enrollee will qualify for benefits shortly after the 5 year vesting period. Thus the premiums will be set to pre-pay the benefits21. This scenario produces an estimated $3,000 monthly premium22. The Program will be sustainable even with a very small number of enrollees. Of course, there is virtually no market for it. Thus, without control for adverse selection, there is little chance for success. From the last group, we refined the concepts and came up with the following plan designs. They are presented from an actuarial, not legal, perspective. The Office of the Assistant Secretary for Planning and Evaluation (ASPE) in HHS contracted Actuarial Research Corporation and Avalere Health to independently develop financial models for the CLASS Program. Both models can determine premiums and project financial results of various CLAS plan designs. Both models are capable of estimating the impact of adverse selection on the premiums and program results. This impact is made a function of the expected enrollment rate of all the workers in the workplace. The higher the enrollment rate, the lesser in the adverse selection effect and vice versa. Each model uses a different source of population data to estimate prevalence, incidence and continuance rates of the use of long-term care services. Entry age premiums are determined by equaling the present value of premiums with the present value of benefits and expenses over the expected lifetime of the enrollees. Program financial results are then derived from projections of the total premiums, investment returns, benefits and expenses. The two models produced consistent and similar results. A technical expert panel comprised of economists and actuaries was assembled in September, 2010 to provide inputs and comments to the model construction. Another panel convened in June, 2011 to discuss model assumptions and alternative CLASS plan designs. These meetings, together with the results from the models, have been helpful in formulating the direction of the CLASS Office regarding plan designs. Subsequent to the expert panel meetings, the HHS actuaries and actuaries from the Social Security Administration met in late June, 2011 to review plan design alternatives. This group agreed that certain plans, designed to mitigate the adverse selection risk (Phased Enrollment, for example), can be actuarially sound and attractive to the consumers. Product design and marketing go hand-in-hand together. Without an attractive product, marketing efforts would be fruitless. Consumer expectation and competition set the requirements for a marketable product design. We believe certain proposed plan designs and the proposed features described in this report have the ingredients for an attractive product. It remains to be seen how the designated plan can be successfully marketed in the worksite marketplace. There are approximately 140 million workers in the United States. The market in the worksites can be roughly divided into 3 categories: large employers with over 5,000 employees, medium-sized employers with 1,000 to 5,000 employees and the remaining are small employers. There are approximately 8,500 employers with more than 1,000 employees. Included are public employee groups. These three categories deserve distinctive marketing approaches. Workers to be enrolled through individual enrollment would also need special attention. We intend to assist in developing marketing tactical plans with the intention to leverage the CLASS Program’s position in the following areas. Without a designated plan and a specific marketing strategy, it is premature to project volume for the CLASS Program. However, it would be useful to understand the financial implication of various scenarios. We constructed a simplified model for this exercise. The model divides the current working population by size of employee groups. It assumes certain penetration rates by group size over a 10-year period based on the differences between expected ultimate penetration rates and current penetration rates. The expected ultimate penetration rates are based on other lines of voluntary insurance such as life and disability income insurance. The current penetration rates are based on private long-term care insurance data. From the penetration rates, enrollments are projected over a 10-year period. The model also contains assumptions regarding premium rates, expenses, benefits, investment returns and persistency. With these assumptions, we generated financial results for the first 10 years of the CLASS Program. We developed results for 3 volume scenarios: minimum, expected and optimistic. In the minimum scenario, we solved for the minimum number of enrollments so that the Program is self-supporting by covering the cost of the CLASS Office staff and other expenses. The optimistic scenario depicts what may happen in an ideal market environment. The expected scenario is what may happen with a reasonable marketing effort but with no change to the current market environment. The projected fund balance for the optimistic scenario is close to the Congressional Budget Offices’ (CBO) $72 billion estimate48. The CBO’s estimate was based on a $123 average monthly premium. In contrast, all 3 scenarios assumed an $80 average initial monthly premium. The optimistic scenario is possible, for instance, if there are cuts in Medicaid and Medicare long-term care benefits coupled with a tax incentive to encourage CLASS participation. Actuarial oversight plays a significant role according to the statute. “The Secretary, in consultation with appropriate actuaries and other experts, shall develop at least 3 actuarially sound benefit plans as alternatives for consideration for designation by the Secretary as the CLASS Independence Benefit Plan”49. (IV) an actuarial opinion by the Chief Actuary of the Centers for Medicare & Medicaid Services certifying that the techniques and methodologies used are generally accepted within the actuarial profession and that the assumptions and cost estimates used are reasonable;”50. With regard to the CMS Chief Actuary’s responsibility, there is a wide range of what can be considered as ‘reasonable’ assumptions. Because of the sensitivity of results from changes in assumptions and the potential negative impact from mispricing, reasonableness should have a stringent connotation. The assumptions chosen for the CLASS plan should produce premiums that have a good chance to be stable. This applies both to assumption settings for the purpose of developing plan premiums and for assessment of actuarial soundness of the Program in the future. Recognizing the extreme difficulty in estimating the effect of adverse selection, plan designs should avoid the potential for adverse selection and moral hazard as much as possible. Assumptions must be chosen with extreme care and after considerable deliberation. Obtain as much relevant experience as possible from multiple sources. Appropriate credibility standards should be followed. Include margins for adverse deviation in the assumptions. Use sensitivity testing of projected financial results to evaluate the margins. It should be noted that long-term care insurance programs are characterized by low incidence rates and relatively high benefit amounts. Claim costs are typically low at the early ages of the enrollees but increase substantially at later ages beyond retirement. The typical time to claim from enrollment is over 10 years. Consequently, small changes in assumptions regarding future events will have a large effect on premiums. As experience from private long-term care insurance has revealed, the likelihood for misjudging future costs is significant. The impact of adverse selection for the CLASS Program may not be identical to that for guaranteed issue group long-term care insurance. Long-term interest return and future benefit inflation rate are difficult to forecast. The induced demand due to payments to family members, especially spouses, is largely unknown. The additional claims due to Temporary Exclusion over the base claim assumption has not been quantified. The $5 subsidized premium has not been completely removed. Possibilities exist for organized efforts to enroll workers with functional limitations. We will continue our actuarial work in two phases. We will complete plan development first and then turn our attention to plan implementation. Obtain external review on premium adequacy. Develop a process to determine enrollees’ individual equity for the purpose of program termination or transfer. We believe the CLASS Benefit Plan can be designed to be a value proposition to the American workers as the CLASS Act prescribed it. Much work remains to be done on plan development. The ultimate size of its enrollment will depend on marketing efforts to produce wide public acceptance of the CLASS Program. In order to use the model developed under contract by ARC as the tool to develop premiums for CLASS, I have conducted a review of the model. It takes a portion of the general working population and determines the premiums that will be sufficient to pay future benefits and expenses. I find the model performs the projection calculations correctly given a set of specific assumptions. These assumptions of future events (claim rates, claim severity, mortality rates, lapse rates, expenses and investment yields) are derived mostly from population data and related experience in private long-term care insurance. A major departure from the experience of private insurance is the effect of adverse selection arising from the lack of underwriting in CLASS. Private insurance provides little help as it is almost always underwritten. The ARC’s model expresses the adverse selection effect as a load to the normal expected claim costs without adverse selection. This load represents the anticipated higher proportion of unhealthy enrollees than in a normal mix of healthy and unhealthy workers. The initial load is assumed to be a function of the enrollment rate and the prevalence rate of severely disabled (i.e. benefit qualifying) enrollees. The load decreases monotonically in time to no less than 10% (see attached exhibit for a more detailed description). While this formula is plausible, the resulting load to the normal expected claim costs is subjective and not supported by actual experience. Moreover, this is only one possible approach and may not even be correct. One can argue that the load may be increasing in the future when all unhealthy enrollees, initially qualified for benefits or not, are taken into account. In order to illustrate the possible range of the adverse selection effect, I calculated the two end points of the range using the model. The monthly premium for an enrollee age 50 at time of enrollment is $60 with no adverse selection51. The corresponding monthly premium with full adverse selection (i.e. all enrollees are qualified for benefits at time of enrollment) is $564, or 9 times. It would even be much higher if claim severity is appropriately adjusted for these enrollees. The model generates a monthly premium of $93 using its adverse selection formula. This wide range bracketing the model premium suggests that the extreme sensitivity of the adverse selection assumption needs to be considered when developing the CLASS premiums. Our task at hand is not merely to produce ‘best-guess’ premiums from a set of assumptions. The proposed plan(s) must be actuarially sound. In conjunction with other provisions, the CLASS Act imposes a rather severe condition for actuarial soundness. That is, the CMS actuary must certify that the assumptions associated with the premiums are reasonable in order to ensure that the CLASS program is sustainable over 75 years. In practice, this is perhaps a more formidable task than the corresponding financial oversight in private insurance. From a solvency perspective, private long-term care insurers are typically multi-lined insurers and their solvency is spread over other lines of business, such as life insurance, annuities, disability insurance, etc. CLASS has only one line; it has no other apparent sources for support. Besides the various underwriting techniques to mitigate adverse selection, insurers control their risk exposure by phased roll-outs over a period of time and by adjusting premiums for newly issued policies. The CLASS program will be made available with limited restrictions through both individual and employer-based enrollment. It will be exposed to an unknown degree of adverse selection at the onset. Premium revision for future enrollees may be too little and too late to temper a larger premium deficiency already in the program. Quick premium revision may be seen as a sign of program instability, thus affecting subsequent enrollment results. CLASS essentially has only one shot to get it right. As we have discussed previously, if the premiums are not set properly, the required premium rate increase may be substantial. In private long-term care insurance, large rate increases have often led to disastrous rate spirals. This is so because the increases are driving out the healthy insureds as premiums become increasingly unaffordable. This is an unacceptable scenario for CLASS. The impact of adverse selection on claim experience is driven by the proportion of unhealthy enrollees in the program. Low enrollment generally means greater likelihood of an unfavorable proportion of unhealthy enrollees. It is a basic insurance principle that any sound insurance program has a good spread of risk. That is, there is an appropriate mixture of healthy and unhealthy enrollees to keep the premiums reasonable and stable. Success in CLASS enrollment will largely depend on the price point and actions from private insurance. CLASS premiums must be attractive relative to the perceived value of the benefits. They will be compared to the respective premiums of private plans. We have previously shown that the premiums from the model are approximately twice that of private group plans with similar benefits. Moreover, agents will be inclined to sell against CLASS to the healthy workers. The proportion of unhealthy enrollees will be dependent on the mixture of individual and worksite enrollment. This proportion is subject to systematic encouragement for enrollment by certain organizations. Because the CLASS program allows individuals to enroll directly, it cannot effectively control the influx of unhealthy workers. The actual results for enrollment and proportion of unhealthy enrollees are highly unpredictable. To illustrate this another way, there are approximately 200,000 workers with 2+ ADLS or cognitive impairment out of approximately 100,000,000 workers52. The normal annual claim rate is less than 2% but it is 100% for these severely disabled workers. Thus these workers are more than 50 times more likely to claim than the average workers in a given year. Suppose we decided that a 20% load53 for adverse selection is marketable against private insurance that has no such load. It would then take 22 healthy enrollees over a 10 year period to support one such disabled enrollee who can readily claim54. In 2010, there were approximately 187,000 policies issued under group long-term care insurance primarily to workers55. Even if we are wildly successful by enrolling half of this figure in one year, we can only allow up to 4,300 workers (less than 3% of the total) who have 2+ ADLs or cognitively impaired to enroll before the loaded premiums are inadequate. Without a valid value proposition to the healthy workers, empirical evidence or any risk mitigating measures, there is great uncertainty in quantifying the adverse selection effect. With its theoretical formula, the ARC model is useful in demonstrating its impact on premiums. However, the model, by itself, should not be relied upon for prudent rate setting. Uncertainty calls for conservatism. My current professional opinion is that the actuarially sound premiums for the basic CLASS plan in the statute, as well as the so called ‘Modified’ CLASS plan, are that of a pre-paid plan56. It is not a coincidence that many experts have maintained that adverse selection is the major obstacle for the CLASS program. Any workable design must address it in order to receive certification as an actuarially sound plan. Note: All alternatives assumed that earnings and re-enrollment issues have been addressed. Alternative:If claim during the first 15 years, the deductible equals to the difference in cumulative premiums of a pre-paid plan and the premiums paid. Description Group enrollments first, number of individual enrollments based on number of enrollees through group enrollment Phased enrollment as with Proposed Plan 1 plus temporary exclusion of benefits for the first 15 years of the beneficiary’s enrollment due to a serious prevailing medical condition at time of enrollment that caused the functional limitation. Waived for group enrollment. Phased enrollment as with Proposed Plan 1 plus low daily benefit for duration of claim, if claimed during the first 20 years of the beneficiary’s enrollment. Waived for group enrollment. Temporary exclusion of benefits for the first 15 years of the beneficiary’s enrollment due to a serious prevailing medical condition at time of enrollment that caused the functional limitation. Scheduled increasing benefits for this 23 years, can be packaged with private insurance so that the total benefits at the same level as the ultimate benefit. Require offer of a basic CLASS plan (i.e. Proposed Plan 6 -- Pre-Paid Plan). No restriction on benefits from enrollment methods, from time of claim or medical condition at time of enrollment. The CLASS Act was enacted as Title VIII of the Patient Protection and Affordable Care Act, P.L. 111-148 (March 23, 2010), which amended the Public Health Service Act, 42 U.S.C. section 201 et seq., by adding the CLASS Act as Title XXXII. They include: Actuarial Standards of Practice No. 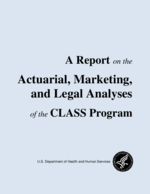 12: Risk Classification, American Academy of Actuaries, updated May 2011, Actuarial Standards of Practice No. 18: Long Term Care Insurance, updated May 2011, and Health Practice Council Practice Note: Long-Term Care Insurance, August 2003. As of the release date of this report, Gregory Kissel is on loan from the Office of Personnel Management on a part-time basis. Current long-term care cost ranges from an average of approximately $16,000 per year for home and community care (assuming 3 hours per day, 5 days a week) to $70,000 for nursing home care -- 2010 Market Survey of Long-Term Care Costs, MetLife Mature Market Institute. Even though the CLASS Program emphasizes care in the community, benefits will be paid regardless of the setting. In this report, community care and long-term care have the same meaning. Less than 8% of Americans under age 65 has private long-term care insurance -- Who Purchase Long Term Care Insurance?Richard W. Johnson and Janice S. Park, Urban Institute, March, 2011. However, approximately 1 out of 2 persons over age 65 will need some formal care in the remaining lifetime. See Long-Term Care Over an Uncertain Future: What can Current Retirees Expect?, Peter Kemper, Harriet L. Komisar and Lisa Alecxih, Inquiry, Volume 42, Winter 2005/2006. UNUM, Genworth Financial and Prudential Insurance Company. Annual Medicaid long-term care spending is projected to grow from $64 billion to $101 billion in 2030 -- Lewin Group, 2010, while the ratio of persons under 65 to persons 65 and over is 4.6 for 2010 and the corresponding projected ratio is 2.8 in 2030 -- U.S. Census Bureau. CLASS Act, Sec. 3203(a)(1), Sec. 3203(a)(2)(B), Sec. 3203(b)(1)(E)(i), Sec. 3206(b)(2)(A)(iii). Actuarial Standards of Practice No. 26: Compliance with Statutory and Regulatory Requirements for the Actuarial Certification of Small Employer Health Benefit Plans, May 2011 and Health Practice Council Practice Note: Actuarial Certification of Rates for Medicaid Managed Care Programs, August 2005. In insurance, moral hazard occurs when certain insured’s behavior results in unfavorable overall experience for the insurance program. For example, spend more insurance benefits than reasonably needed if they have to be paid out-of-pocket. Actuarial soundness for the CLASS plans suggests a margin for unfavorable experience built into the premiums, similar to the specific margin for adverse experience required in long-term care insurance since 2003. The discount rate equals to a fixed interest rate used for statutory reserving. This assumes a 20% expense ratio for CLASS. See later section for a discussion on expenses. We recognize that certain enrollees’ attributes may partially offset the effect of asymmetric information. For example, risk-averse individuals tend to be attracted to insurance and are healthy. However, this attribute is already embedded in private insurance’s experience. See Multiple Dimensions of Private Information: Evidence from the Long-Term Care Insurance Market, Amy Finkelstein and Kathleen McGarry, American Economic Review, September 2006. In the toothache insurance example, this is analogous to charging $1,000 premium. Because the expected number of claims is highly dependent on the number of enrolled workers who already had a toothache, we suggest that this is the only prudent premium that ensures a high likelihood of program sustainability. See Adverse Selection, Memo to Kathy Greenlee from Bob Yee, April 27, 2011 (Attachment 1). See Design Alternatives, May 6, 2011 (Attachment 2). Clearly high risk employees can still select against the insurance plans even with a short enrollment period. Although one insurer no long in the group business is in the process of filing for premium increase, the overall experience to date suggests that this adverse effect from group enrollment is manageable and insurers have adjusted their claim expectation accordingly. CLASS Act, Sec. 3206(c)(2)(B)(i)(III - IV). Thus individual enrollment would have 400% extra claims than group enrollment. The initial estimation of expected increase in claim costs can be quantified through a study of disability status of individuals declined for private long-term care insurance. Depending on the cost estimates for this provision, the 15 years may have to extend to 20 years in order to keep the CLASS premiums competitive. In the toothache insurance example, a high participation rate helps to keep the premium relatively reasonable. If 80 workers (including all 5 workers already had a toothache) enrolled, the premium of $156 [(5 + 75 x 10%) x $1,000 ÷ 80] is a more tolerable and predictable premium compared with the prospect if only 6 workers enrolled. See Attachment 3 for a summary of the proposed plans. The purpose of this comparison is to merely illustrate the possibility of developing a CLASS plan that is reasonably price competitive with private group insurance. The CLASS premiums have not been finalized. Note in particular that the comparison is between the level premiums of private group insurance plans and the initial premium for the CLASS plan with an increasing premium schedule. In addition, this premium illustration is not derived from models provided by Actuarial Research Corporation and Avalere Health as described in the Actuarial Modeling section below. U.S. Consumer Price Index for Urban Nursing Home and Urban Adult Day Care Costs, National Care Planning Council, http://www.longtermcarelink.net/eldercare/ref_cpi_inflation_rate.htm. The entire schedule can move up or down according to experience of the program. See, for example, Low-Income Workers and Their Employers -- Characteristics and Challenges, Gregory Acs and Austin Nichols, Urban Institute, 2007. CLASS Act, Sec. 3203(b)(1)(C) and Sec. 3203(b)(1)(E). CBO letter to Rep. George Miller from Douglas Elmendorf, November 25, 2099. The plan tested is the ‘Modified’ CLASS with waiver of premium and 2% enrollment rate. ‘Modified’ here refers to the CLASS plan with the proposed Senate amendments (in particular, allowed for indexing of premiums). 2009 National Health Interview Survey and 2009 Current Population Survey (PINC-05) people age 15+ with annual income greater than $12,500. We can expect that any load much above 20% will dramatically reduce enrollment to a point where the proportion of unhealthy enrollees is intolerable. This illustration conservatively ignored those enrollees who are disabled but do not yet qualify for benefits under CLASS. A pre-paid plan, such as a dental plan, anticipates that nearly everyone who enrolled will claim. Thus the premiums approach the value of the benefits.